Another timely post. My cacti and succulents are all safely put away but sometimes time to laziness gets in the way and I may not get to them. It’s always good to get a reminder. Thanks. Always look for your posts. Hello, I live in South San Francisco,Ca. Hi Betsy — Yikes! Big garbage bags? Not a good idea unless you’re using them somehow to make an umbrella. Think of it this way: What if you had a pet that for whatever reason was exposed to cold and rain and you wanted to protect it, but you couldn’t move it? You wouldn’t cover it with plastic! The poor thing needs sunlight and air circulation, and plastic holds in dampness—and besides, rain simply rolls off of it and soaks the ground anyway. Hopefully your pet succulent is growing in fast draining soil, atop a mound or berm, so its roots aren’t sitting in water. If not, topdress the soil with pumice, a crushed volcanic rock that absorbs moisture. If you have a patio umbrella with a concrete stand (so it won’t blow over), use it keep rain off the plant. But the bigger issue is what’s going on in the soil. Sodden roots are in danger of rotting. I live in SF near Daly City and it was suggested to me by Sloat Gardens to cover the more sensitive succulents with burlap. Many of my green aeoniums have had frost damage but almost all the others are fine! My soil is pretty sandy so the roots aren’t soggy, I assume South City soil is pretty similar? Hi Debra, I just discovered your site and I love it…thank you. We live on Bainbridge Island, near Seattle, and our garden is going to be on the Garden Tour this year, so I’m trying to spruce things up a bit. I recently made a few succulent wreaths, including a horse head (I’ll post a picture to your FB page.) I used two heavy wire frames, lined the bottom one with coco fiber, sandwiched them together with sphagnum moss in the middle, tied them together, added another layer of moss on top (secured with fishing line) then planted. I sprinkled a bit of potting soil over the top to help hold the tiny ground cover “hair” in place. We are experiencing our typical NW 40-50 degree rainy weather right now, and I’m hoping to hang the wreath in early June, so it has lots of time to root and fill in. Shall I leave it outside in the rain (it’s elevated on little cups for drainage), assuming the temperature doesn’t drop below freezing, so should I bring it in under the eaves? Thanks! I don’t know WHAT I was thinking by not bringing my succulents inside last night when the temps got down to 23! I live in Northern AZ, and I have had some plants that have been coming along nicely…until this morning! I am assuming to bring them in and see what spring brings, from reading your post? Should I also not water them right away? In our area we are at 5,000 feet of elevation, and the temps have a variance of about 30 – 40 degrees between night and daytime. They usually do well out here, except in the extreme heat we get and sun (100+ degrees), and then the winter temps overnight/early morning. I guess I am wondering if there is anything I can do to help “bring them back” in health and appearance other than bringing them inside? I was going to leave them out in the sun today since the high will be 62 today, then bring them in tonight. Anything I can add to their watering? Thanks so much! 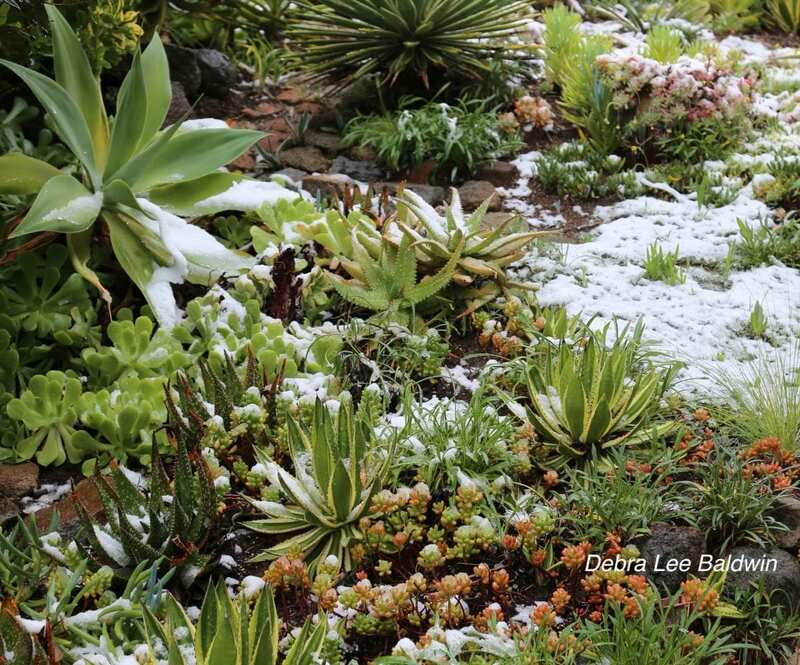 Hi Barbara — I’m so sorry to hear your succulents were likely damaged by frost. It’s hard to say without seeing them, but it doesn’t sound like they’re among the few varieties that can survive temps to 23 degrees F. It’s possible that you can prune off the damaged tissue and they’ll sprout new growth from what’s left of the stem or even the roots, but it’s by no means a certainty. And in any case, once frost damages its leaves, the symmetry and beauty of a succulent may be compromised beyond repair. But take heart. In your climate, it’s best to consider succulents annuals. After all, many lovely ornamental plants (such as nasturtiums, pansies, petunias and the like) are not expected to survive the winter. Why should succulents? Discard the damaged plants, forgive yourself, and look forward to getting fresh ones in spring.